The DrayTek Vigor 2110 Series routers are designed to be the ideal cable-broadband sharing and firewall device for to the SoHo (Small Office / Home) user. 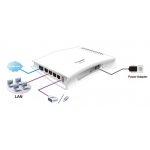 They combine compatibility with the latest cable modem connections (from Virginmedia) and other Ethernet fed Internet connections together with performance, features and price into an attractive, relible and easy-to-use product, with the pedigree and thoughtful design DrayTek are renowned for. Wireless (WiFi) and VoIP equipped models further enhance the flexibility of the router and outgoing VPN makes it ideal as a teleworker router for your home VPN link to your main office. A new style case for this range provides stylish looks and space saving design, allowing upright desk usage or wall-mounting. Cleverly conceived cable entry points also minimuse the overall size of the unit. The Vigor 2110 isn't just for cable-modem lines; you can instead use a 3G modem from any of the main carriers (Orange, T-Mobile, Vodafone etc.) for Internet connectivity instead of a cable-modem. See the '3G' section for more information. 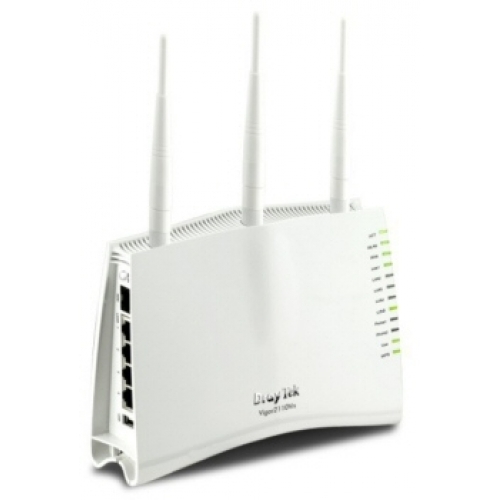 The Vigor 2110 Series routers with built-in Wireless LAN ('n' models) allow you to use your wireless equipped computers or laptops wirelessly, without needing a cable back to the router; this provides convenience and mobility in your home or office. By adding an additional Vigor 2110 wireless model, you can expand the wireless range using WDS (in repeater mode). For increased range/coverage, DrayTek have a range of directional aerials (see 'accessories'). All major cellphone networks within Europe now support '3G data'; this uses the latest 3G networks for high-speed data connections to the internet in addition to regular phone calls. The latest 'HSDPA' version provides speeds up to 7.2Mb/s* download, which is comparable with fixed broadband lines but with added flexibility, mobility and convenience. All of the networks supply USB 3G modems (shown on the right); these are typically available 'free' on most monthly data contracts, or to buy on PAYG ('Pay as You Go') packages. In addition, many 3G phone handsets also have a 'modem' facility with a USB cable which is compatible with the DrayTek routers. The 3G USB modem connects directly into a DrayTek router/firewall and provides shared Internet connectivity to all PCs and other devices on your network, including wireless laptops (assuming you select DrayTek product with WiFi). All models in the Vigor2110 series support 3G modem access to the Internet instead of using a cable-modem. That's ideal for temporary installation, locations where ADSL/cable isn't available or a cheaper alterative to cable-modems (depending on your usage and contract/package). Check with your chosen network provider for their current contractsd or PAYG schemes, as well as the model of USB modem they would supply you with. Additional Modem Support is added continuously or you can request specific models by following the Instructions Here. A USB cable is required for your phone and some modems (not supplied). Note: DrayTek have no control over local network/provider operations, changes in network facilities/tarrifs nor make any claim over specific network compatibility. Please assure yourself that the router will be compatible with your chosen cellular network and provider and that you have adequate signal coverage before committing to any contract term. Please also ensure that your chosen provider and the tariff allows access to all of your required applications (e.g. VPN, VoIP, Messaging etc.) as many packages exist, some blocking certain data types.